Setting your Samsung Galaxy S5 to automatically upload photos and videos taken by its camera is one effective way to back them up. Once uploaded successfully, those photos/videos can easily be re-downloaded to your phone after a factory reset; all you need is internet connection, your username and password. You have, at least, three options which service to use. There is the Samsung Link, Google Photos, and Dropbox. Click on any of the links below to go to that section. To be able to use the Samsung Link service, you need to have a Samsung account and if the Samsung Link application isn't installed on your Galaxy S5 yet, download it from the Google Play Store. If necessary, scroll to the screen where Samsung Link icon is located and tap on it. In case you haven't setup your Samsung account yet, touch Sign In. Otherwise, touch the other option--Get started. Tap the More options icon and choose Settings. Now, touch the Auto upload slider to turn it On. Touch None to choose from the services you want your photos and videos uploaded to. Once you're chosen from the options, you will be asked to choose what content to upload. The options are Photos, Videos, and Photos/Videos. Touch Auto upload settings and choose from two options: New (from now) and New and existing (all). If you want your contents upload via mobile data, touch the slider beside Use mobile networks from Off to On. Tap the Back key to save the changes. Your phone will now auto upload your photos/videos to the service you've chosen or to your computer depending on your preferences. 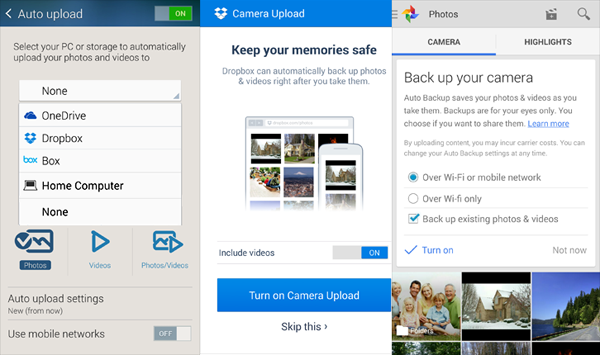 The Dropbox app can automatically upload your photos and videos to your Dropbox account into a directory called Camera Uploads. Of course, you need to have a Dropbox account first as you will be using that to setup the app. Touch Sign in to enter your existing Dropbox account. If you, however, haven't signed up yet, you can do so through the apps by tapping Sign up for Dropbox. Photos will automatically be upload once you set the app to do so, if you want to include videos, tap the Include videos slider to turn the feature on. Since you are an Android user, I'm sure you already have a Google account or Gmail, which you may have used in setting up your phone for the first time. Through the Google+ application, you can automatically backup your photos and videos. If you're concerned about privacy, don't worry because pictures and videos that were automatically uploaded are set to private and will not be visible to anyone except you. Now, here's how you set your phone up to auto backup your multimedia files to Google Photos. Scroll to and tap Photos app. If you haven't opened the Google+ app before, touch Sign in. The next screen will prompt you to Back up your camera. You also have to set the method on how to upload your photos. Your options are Over Wi-Fi or mobile network and Over Wi-Fi only. The photos and videos that are already in your phone's storage will not be uploaded unless you put a check mark on the option Back up existing photos & videos. If everything is set, touch Turn on. I hope that this post has, somehow, helped you. All steps cited here are basic and don't require advanced knowledge with Android. However, it's still up to you if you want to automatically upload or backup all your photos and videos. Please adjust settings in these apps to your preference. If you have problems with your phone, feel free to email me at harold@droidista.com and I will get back to you as soon as I can. Thanks for reading.